A guest post by Wiep van Bunge. Rienk Vermij has demonstrated quite convincingly that the first Dutch Newtonians were actively engaged in countering the threat Spinoza posed (Vermij 2003). A crucial moment in the simultaneous demise of Spinozism and the rise of experimental philosophy was Bernard Nieuwentijt’s publication, in 1715, of his famous Het regt gebruik der wereldbeschouwingen – translated into English, French and German. Nieuwentijt specifically marked out Spinoza’s atheism as his main target, inspiring many dozens of countrymen and many others abroad to discern the providential reign of a supernatural Creator, who was not to be identified with Nature in the way the Spinozists had been doing for several decades. More interesting, however, is his posthumous Gronden van zekerheid, in which he further developed a number of comments on mathematics made by one of Spinoza’s earliest critics, the linguist and philosopher Adriaen Verwer in his 1683 refutation of Spinoza’s Ethics. Verwer had warned his readers against Spinoza’s confusion of entia realia, things that really exist, and entia rationis, things we can talk about coherently but which are only supposed to exist even though we are able to conceive of them clearly and distinctly. Spinoza’s fundamental error, according to Verwer, consisted in supposing that once a clear and distinct idea has been formed, the ideatum conceived of in the idea really exists (Verwer 1683; 1–5). In Gronden van zekerheid Nieuwentijt first elaborates on the distinction between ‘imaginary’ (denkbeeldige) and ‘realistic’ (zakelijke) mathematics, that is between a mathematics concerned with abstract notions without any corresponding objects in reality, and a mathematics concerned with objects the reality of which has been established by experience. Thus Nieuwentijt attempts to ensure that the use of mathematical reasoning is reserved for the behaviour of natural, observable objects. After having demonstrated the benefits of a ‘realistic’ use of mathematics, Nieuwentijt in the fourth part of Gronden van zekerheid accuses Spinoza of being merely an ‘imaginary’ mathematician, who just made it look as if his abstract metaphysics had anything to do with the real world. In reality, or so Nieuwentijt felt, Spinoza was only talking about his own, private ideas. What is worse, Spinoza consciously refused to acknowledge the need to ascertain the correspondence of these ideas to any external reality, as is evident, Nieuwentijt continued, from Spinoza’s conception of truth. Neither was he prepared to check the truth of his ‘deductions’ against any empirical evidence, which led him to preposterous conclusions, such as regarding the human intellect as being a part of God’s infinite intellect as well as an idea of an existing body (Nieuwentijt 1720: 244ff). Throughout Gronden van zekerheid Nieuwentijt points to the obvious alternative to Spinoza’s ‘figments of the imagination’: the experiential ‘realistic mathematics’ adopted by the Royal academies of Britain, France and Prussia as well as by countless serious scientists across Europe. Philosophy, Nieuwentijt contended in the fifth and final part of his book, should become a ‘realistic metaphysics’ (sakelyke overnatuurkunde), which rests on the same foundations that realistic mathematicians build on: faith in the revealed Word of God and experience, to which he adds that philosophers are often best advised to suspend judgment because we simply lack the data necessary for answering many of the question traditionally raised by metaphysicians (Nieuwentijt 1720: 388ff). 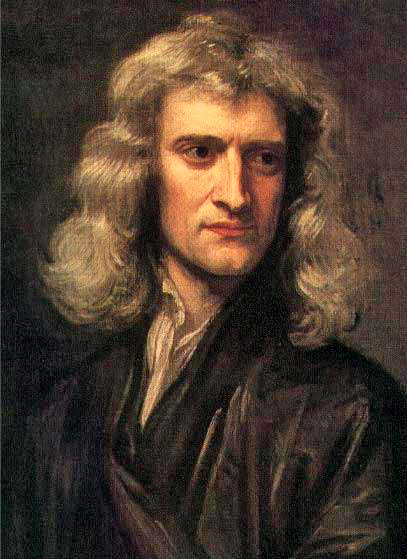 Newton, ‘the mathematical Knight’, had shown the way by setting up experiments in order to confirm the truth of conclusions arrived at by means of deduction and by making sure that the general principles from which these conclusions derived were the result of ‘empirical’ induction (Nieuwentijt 1720: 83–84; 188 ff). In addition, Nieuwentijt was happy to confirm that Newton’s work clearly established the providential reign of the Creator over His creation, making it an ideal weapon in the fight against atheism (Nieuwentijt 1720: 228). It would seem, then, that in Nieuwentijt’s eyes, and Verwer appears to have been of the same opinion, Spinozism was actually a philosophical instance of ‘enthusiasm’ – not unlike the German theologian Buddeus’ earlier suggestion (Buddeus 1701: 15–16). Both were appalled to read that according to Spinoza ideas were true to the extent that he himself felt them to be true, instead of checking their correspondence to the world as we know it. Thus Nieuwentijt continued an Aristotelian and humanist tradition according to which ‘contemplative philosophy’ represented a type of ‘philosophical enthusiasm’ (Heyd 1995: Ch. 4). Buddaeus, I.F., Dissertatio philosophica de Spinozismo ante Spinozam (Halle, 1701). Heyd, Michael, ‘Be Sober and Reasonable’. The Critique of Enthusiasm in the Seventeenth and Early Eighteenth Centuries (Leiden, 1995). Nieuwentijt, Bernard, Het regt gebruik der wereldtbeschouwingen, ter overtuiginge van ongodisten en en ongelovigen aangetoont (Amsterdam,1715). –, Gronden van zekerheid, of de regte betoogwyse der wiskundigen, So in het denkbeeldige als in het het zakelyke (Amsterdam, 1720). Vermij, Rienk, ‘The Formation of the Newtonian Natural Philosophy. The Case of the Amsterdam Mathematical Amateurs’, The British Journal for the History of Science 36 (2003), 183–200. Verwer, Adriaen,’t Mom-Aensicht der atheisterij afgerukt door een verhandeling van den aengeboren stand der menschen (Amsterdam, 1683). Early Eighteenth-century Experimental Philosophy in the Dutch Republic. Attendance is free, but registration is mandatory. To register please send an e-mail to jip.van.besouw@vub.ac.be before 1 July. In my last few posts, I have been discussing the nature of observations and experiments in Newton’s Opticks. In my first post on this topic, I argued that Newton’s distinction between observation and experiment turns on their function. That is, the experiments introduced in book 1 offered individual, and crucial, support for particular propositions, whereas the observations introduced in books 2 and 3 only supported propositions collectively. In my next post, I discussed the observations in more detail, arguing that they resemble Bacon’s ‘experientia literata’, the method by which natural histories were supposed to be generated. At the end of that post, I suggested that, in contrast to the observations, Newton’s experiments look like Bacon’s ‘instances of special power’, which are particularly illuminating cases introduced to provide support for specific propositions. Today I’ll develop this idea. Note, before we continue, that there are two issues here that can be treated independently of one another. One is establishing the extent of Bacon’s historical influence on Newton; the other is establishing the extent to which Bacon’s methodology can illuminate Newton’s. In this post I am doing the latter – using Bacon’s view only as an interpretive tool. Identifying ‘instances of special power’ (ISPs) was an important step in the construction of a Baconian natural history. ISPs were experiments, procedures, and instruments that were held to be particularly informative or illuminative. These served a variety of purposes. Some functioned as ‘core experiments’, introduced at the very beginning of a natural history, and serving as the basis for further experiments. Others played a role later in the process. They included experiments that were supposed to be especially representative of a certain class of experiments, tools and experimental procedures that provided interesting shortcuts in the investigation, and model examples that came very close to providing theoretical generalisations. In some cases, a collection of ISPs constituted a natural history. The following features were typical of ISPs. Firstly, they were considered to be particularly illuminating experiments, procedures or tools. For example, a crucial instance, or a particularly clear or informative experiment, or experimental procedure. Secondly, they were supposed to be replicated. On Bacon’s view, replication was not merely an exercise for verifying evidence; it was an exercise for the mind, ensuring that one had truly grasped the phenomenon. Thirdly, they were versatile, in that they could be used in several different ways. As we shall see, the experiments of book 1 display these essential features. In book 1 of the Opticks, Newton employed a method of ‘proof by experiments’ to support his propositions. Each experiment was introduced to reveal a specific property of light, which in turn proved a particular proposition. We know that Newton conducted many experiments in his optical investigations, so why did he present the experiments as he did, when he did? When we consider Newton’s experiments alongside Bacon’s instances of special power, common features start to emerge. Firstly, for each proposition he asserted, Newton introduced a small selection of experiments in support – those that he considered to be particularly illuminating or, in his own words, “necessary to the Argument”. Unlike in his first paper, in the Opticks, Newton did not label any experiments ‘experimentum crucis’. But his use of terms such as ‘necessary’ and ‘proof’ make it clear that these experiments were supposed to provide strong support: just like ISPs. Secondly, Newton usually provided more than one experiment to support each proposition. These were listed in order of increasing complexity and were carefully described and illustrated. That Newton took this approach, as opposed to just reporting on their results, suggests that these experiments were supposed to be an exercise for the reader: they were about more than just proof or confirmation of the proposition. The reader was supposed either to be able to replicate the experiment, or at least to understand its replicability. Starting with the simplest experiment, Newton led his reader by the hand through the relevant properties of light, to ensure that they were properly grasped. Like Bacon’s ISPs, then, Newton’s experiments were intended to be replicated. Thirdly, Newton’s experiments were recycled in a variety of roles in the Opticks. For example, the experiments he used to support proposition 2 part II were experiments 12 and 14 from part I. Newton introduced and developed these experiments in several different contexts to illuminate and support different propositions. Again, this is typical of Bacon’s ISPs. And so, Newton’s experiments in the Opticks play a role analogous to Bacon’s instances of special power, and thinking of them as such explains why they are presented as they are. They are particularly illuminating cases that are introduced to provide support for specific propositions. Newton selected the experiments which best functioned as ISPs for inclusion in the Opticks. Moreover, seen in this light, the seemingly disparate set of experiments start to look like a far more cohesive collection, or a natural history. Many commentators have emphasised the ways that Newton deviated from Baconian method. Through this sequence of posts, I have argued that the Opticks provides a striking example of conformity to the Baconian method of natural history. Two years ago on this blog I addressed the ‘Straw Man Problem‘ for the distinction between experimental and speculative philosophy. The apparent problem, according to some critics of the ESD, is that there were no speculative philosophers in the early modern period. 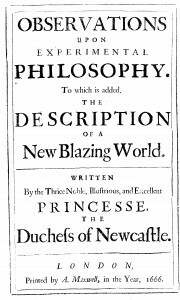 In my response to that problem I listed The Duchess of Newcastle, Margaret Cavendish, as one of the few advocates of speculative philosophy in seventeenth-century England and in this post I want to explore her views in a little more depth. Cavendish wrote the most sustained critique of experimental philosophy in the seventeenth century. Her Observations upon Experimental Philosophy, comprising 318 pages, was first published in 1666 and went into a second edition in 1668. 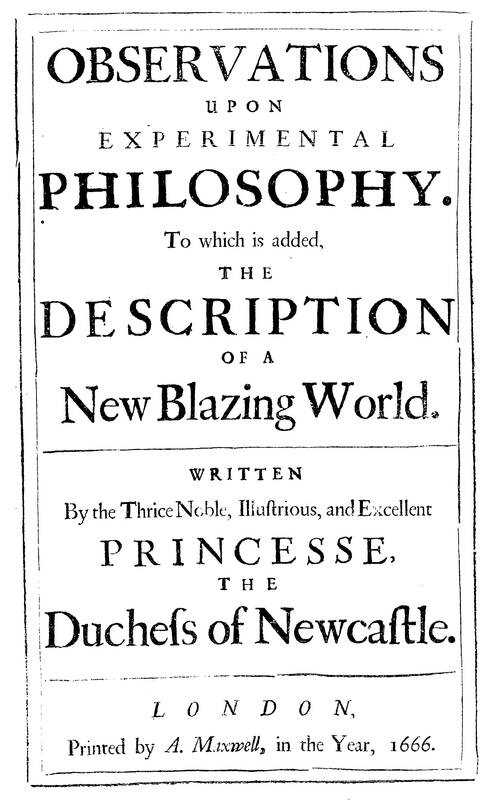 In this work Cavendish gives a critical reading of many works of the new experimental philosophy in order to justify her own speculative natural philosophy. Within her sights are Robert Boyle’s Sceptical Chymist (1661), Henry Power’s Experimental Philosophy (1664) and Robert Hooke’s Micrographia (1665). It is interesting to compare Cavendish’s views in this work with those of the young Robert Boyle a decade earlier. As I pointed out in my last post, in his ‘Of Naturall Philosophie’ of c. 1654, Boyle claims that there are two principles of natural philosophy, the senses and reason. He plumps for the senses. Cavendish in her Observations acquiesces in the very same principles, but takes the opposing line: for her, reason trumps the senses. Cavendish’s Observations first appeared at a very sensitive time for the Royal Society, for it had been the subject of much criticism from without and was in the process of securing an apologetical History of the Royal-Society by Thomas Sprat. Now, there is no doubt that some of the more prominent Fellows of the Society are in view in her critique. Yet, it is important that we do not over-extend the target of the Observations, for, it is very much aimed at experimental philosophy and hardly makes reference to the Royal Society at all. Within a year of its publication the Duchess was to make a famous visit to the Society and the correspondence that ensued does not suggest that Henry Oldenburg and others regarded her as a hostile critic of the Society. This reinforces the view that her focus was more specific, namely, experimental philosophy. They cannot chuse but miserably stray. For her Philosophy was all her own. Of Occult Quality or Sympathy. This poem in which these lines appear was penned by the poet Thomas Shadwell, author of The Virtuoso. Shadwell presents the Duchess as holding to a more balanced view of the relative value of practice and speculation than is warranted from her writings. But the fact that he has singled this out is indicative of just how central was this issue to thinkers of the day.